The Son-Rise Program was created by authors/teachers Barry ("Bears") Neil Kaufman and Samahria Lyte Kaufman when their son, Raun, was diagnosed as severely and incurably autistic. 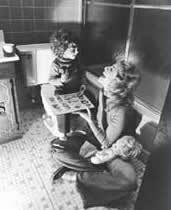 Although advised to institutionalize him because of his "hopeless, lifelong condition," the Kaufmans instead designed an innovative home-based, child-centered program in an attempt to reach their little boy. The Kaufmans' unique program, which marked a complete departure from existing methods of treatment, transformed Raun from a mute, withdrawn child with an IQ of less than 30 into a highly verbal, socially interactive youngster with a near-genius IQ. Bearing no traces of his former condition, Raun graduated from an Ivy League university and went on to become the director of an educational center for school-aged children. He currently teaches families and individuals at the Autism Treatment Center of America. Following the publication of the best-selling book, Son-Rise (now updated to Son-Rise: The Miracle Continues), and the award-winning NBC-TV movie Son-Rise: A Miracle of Love, the Kaufmans were flooded with requests for help. Responding to this demand, the Kaufmans established The Option Institute and the Autism Treatment Center of America, where they have been offering The Son-Rise Program since 1983. Individuals from 130 different countries have attended programs at the Autism Treatment Center of America in Massachusetts and at our various international outreach programs. The Kaufmans are the authors of 12 books. There are over 3 million copies of their books in print, in 22 languages in over 65 countries. Several of these books are required reading for courses at more than 280 universities. The Son-Rise Program® and the Kaufmans have been featured in over 2,000 articles and programs appearing in major media worldwide, including: The New York Times, The Washington Post, The Los Angeles Times, The Chicago Tribune, Cosmopolitan Magazine, Self Magazine, Parenting Magazine, The Daily Telegraph, The BBC (British Broadcasting Company) and Good Morning America. The Kaufman's works have been endorsed by such well-respected figures as Coretta Scott King, Jimmy Carter, Dr. Carl Rogers, Deepak Chopra, Bernie Siegel, Norman Cousins, Lou Holtz, John Bradshaw, Dr. Wayne Dyer and many others.